Fast becoming a favourite product for those who wish to revamp and expand existing office and storage space, composite partitions provide an attractive, cost effective alternative to other forms of room dividers. Of sandwich construction using MDF or flax board externally, and chipboard or honeycomb as the filling, these composite partitions provide a lightweight, durable product which is ideally suited for office and store room construction. 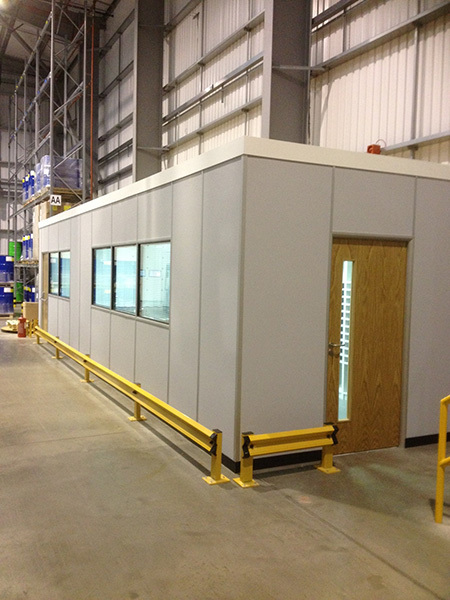 As a modular, versatile, demountable panel, they can be quickly erected to any configuration required. They come pre-laminated and pre-decorated in a variety of the most popular wall coverings, as well as powder paint finishes. Should you want panels in your corporate colours please discuss your requirements with our staff. Available in a variety of specifications, they are constructed around a 50 mm aluminium frame which the panels slot into. They can be fully solid, half glass/half composite, or full glass (with frame). As with all our panels, composite partitions can be constructed to take standard single doors, double doors or sliding doors if corridor space is limited. Constructed of soft materials, chipboards and laminates as opposed to hard steel construction, much of the hubbub of daily office operations is absorbed. Should you require quiet rooms; discuss the possibility of adding acoustic insulation to the partitions with one of our representatives. Composite industrial partitions are the ideal solution for constructing attractive, additional office facilities on the factory floor, on mezzanine floors, or where office and workstation complexes are being constructed in open plan warehouse or office space. As a long established national company we like to think we provide the very best of service for our clients. Our length of time and status within the industry is testament to how we approach each project, and our large amount of referral contracts shows the level of customer satisfaction we achieve. When you contact Industrial Partition Systems, from day one you will be assigned a dedicated project manager who will work with yourself, with our in house design teams, and our onsite construction teams. All designed to provide you the most professional service in a fast, efficient and satisfactory manner. Looking to have composite partitions installed at your premises? Call us today on 0115 736 5986 to get a free fixed-price quote on your project. Composite partitions provide an excellent way to section off an office space or other area that you’d like to keep separate from the main production area. We can install windows and doorways as part of our composite partitions which allows you to create ‘bolt-on’ rooms within your facility. Your own branding can also be applied to partitions if you wish and this means they are ideal for creating a manager’s office or customer waiting area. Call us today on 0115 736 5986 for a free, fixed-price quote.